Mixed media on paper, 6" x 6"
Sometimes the best thing you can do is ruin a painting. Why? Because the pressure's off. The work is already toast, why not mess around with it a little more and experiment--maybe try an approach or technique you haven't tried before? This painting began as a watercolor on heavyweight Fabriano paper. I wasn't happy with it, so I sprayed it heavily with fixative to isolate the paper surface, then overpainted with oil. 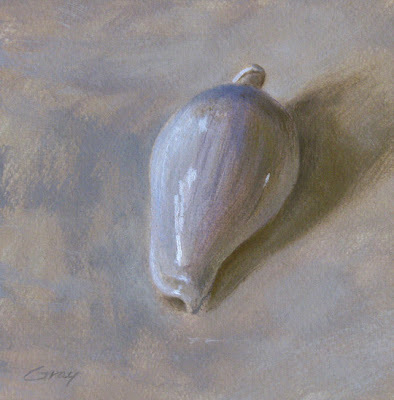 The watercolor acts as an underpainting and the oil allows a range of subtle color and value that better captures the beautiful porcelain-like quality of the shell. I'm much happier with it now. I just hope nobody heard the cussing earlier. I love this one. Thanks for sharing the work in progress story. Beautiful. Really lovely how you put that shine on the shell. Using watercolor as sort of an underpainting might be something to work with? Nice, Don. You really nailed that creamy, smooth reflective surface with little fuss. Hope you're well! I love the palette and the transparency. Necessity is the mother of invention is the father of cleverness. Thanks, RUDHI. Yes, I found your cherries--nice! Thanks for the visit and comment, Donald. Yes, I'll probably experiment with that technique some more. Thanks, Suzanne--great to hear from you. Thanks, Sam. It feels good when once in awhile I pull a painting back from certain death. Very cool, Don, that you were not only able to make this painting work but combine two very unmixable mediums too! Glad you like it, Leslie--thanks for your insights. Your recent works are really intriguing.